THIS HOME IS BEING SOLD TURNKEY!! 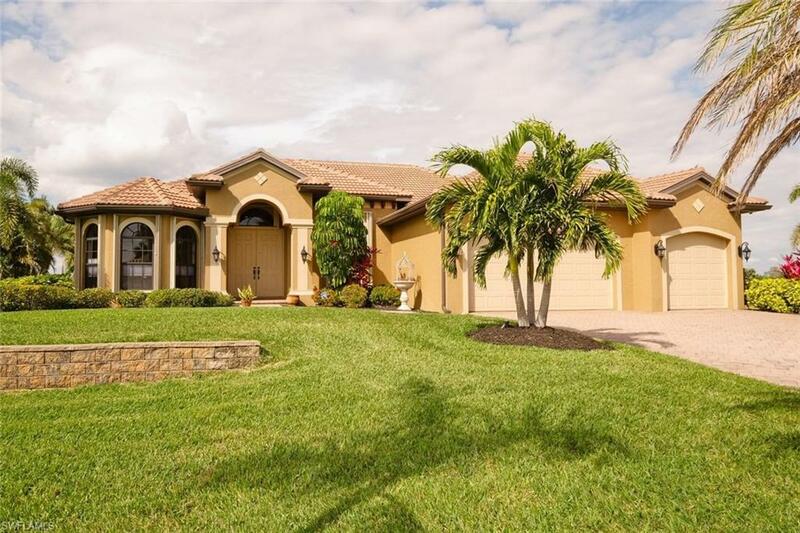 LOCATED IN CAPE ROYAL WHICH IS THE ONLY GATED GOLF COMMUNITY IN THE CAPE CORAL AREA! Superior construction on this gorgeous home, built in 2007 to the newest hurricane codes with an added layer of security and protection with hurricane accordion shutters. Custom builder paid attention to every detail, finished with great diligence and best materials such as Granite and Marble countertops, California Closets in Master suite, wooden shelves in any other closets, extractable wooden gliders, cherry wood cabinets , stainless steel GE kitchen appliances, large porcelain tiles, hardwood laminate, upgraded elegant carpet. Den could also serve as 4th bedroom. Extra Large 3 car garage to protect all your Man's toys. Lot overlooking golf course and a lake, low maintenance landscaping, and pavered drive way. Cape Royal is a gated, financially strong golf community without all the fees, Pine Island public water and it's location in Lee County(not Cape Coral) means lower taxes and water fees. Please review the pictures and enjoy the virtual tour.